The location was great - so accessible to public transport, the train, the beach, etc. Restaurant crowd in the courtyard could get noisy, but after the first night did not really notice this at all. Would have been nice to have some local info about the nearest grocery store. Location, excellent, very close to Prom. d'Anglais, beach, and in the middle of restaurants and stores. Comfortable bed, air conditioning that worked well, and we had all the kitchen facilities we needed (we had Rauba room). Overall, clean. Everything was good. Location -super. We had good time. Location is perfect, very central. Kitchen is useful. 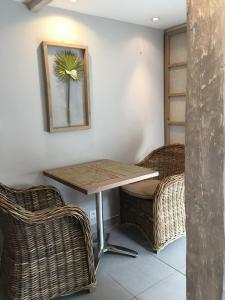 The location was really good, walking distance to the train station and the beach. 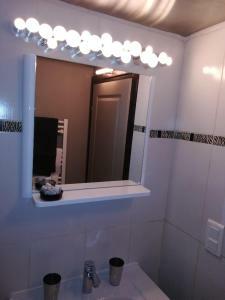 great location, apartment neat and tidy, clear and easy instructions about pick and drop key off. The host was nice and kind with us. Mattress and pillows very comfy. Easy way to collect the keys. 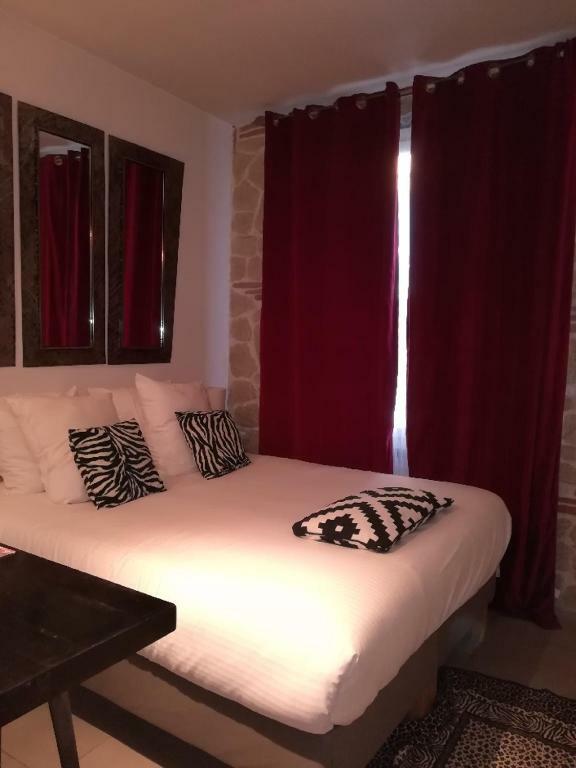 The area is perfect , 1 min walking from Place Massena , tram, bus, shops, bars and carnival parade. The location was perfect--right in the heart of everything. The price was very good and the suite was reasonably well equipped. 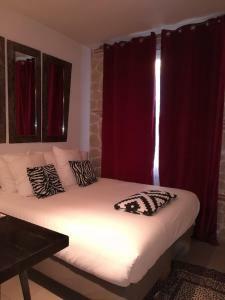 Lock in a great price for Intérieurs-Cour – rated 8 by recent guests! 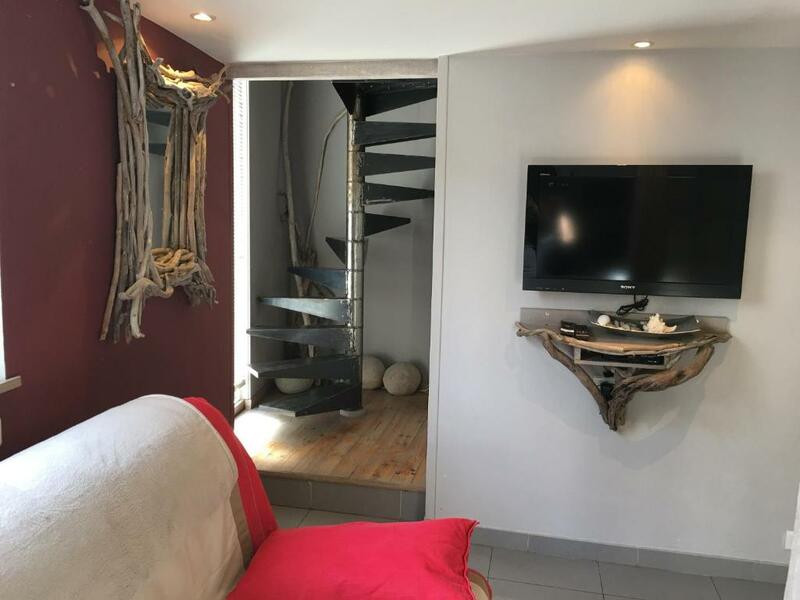 One of our top picks in Nice.Located in Nice city center, a 5-minute walk from the old town and the beaches, this residence features original self-catering accommodations, each with its own theme and style. Flat-screen TV and free Wi-Fi are provided. 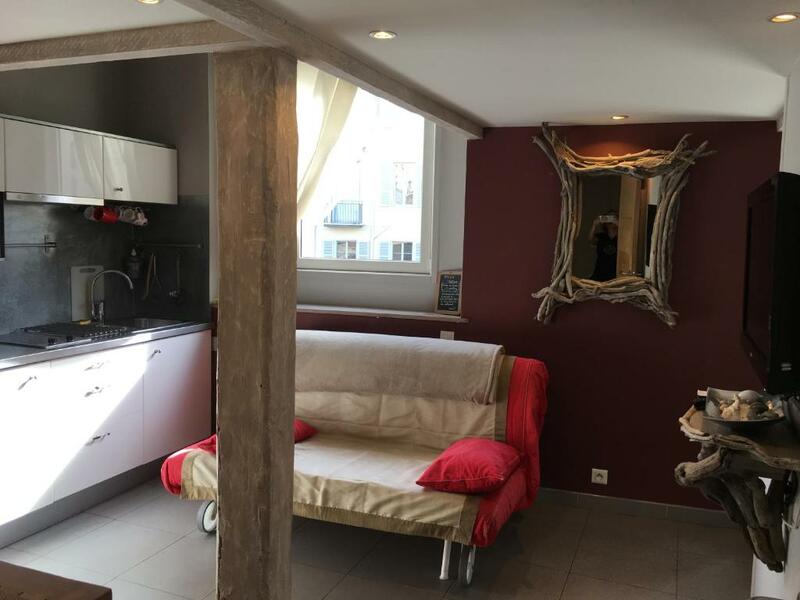 With a modern décor, accommodations at Intérieurs-Cours include a fully equipped kitchen with microwave and hotplates and a private bathroom. Some apartments also have a hot tub and a terrace. All units are located on the 3rd floor and are only accessed by stairs. Set in a pedestrian area, this residence is very close to many shops, bars and restaurants while the famous Promenade des Anglais is only 1,650 feet from the residence. The Opéra is a 7 minutes’ walk and Nice Cathedral is 2,450 feet. Nice Train Station is 0.7 mi away and the Airport is a 15-minute drive. When would you like to stay at Intérieurs-Cour? Guests are requested to take out the rubbish and clean the kitchenware. If not, an extra fee will be charged. - open bathroom with hot tub. - seating area with sofa bed. This air-conditioned studio has a fully equipped kitchenette with a counter, a flat-screen TV and a bedroom on the mezzanine accessible by a folding ladder. The bathroom has a shower, a hairdryer, a washbasin and a toilet. A sofa bed is available upon request free of charge. 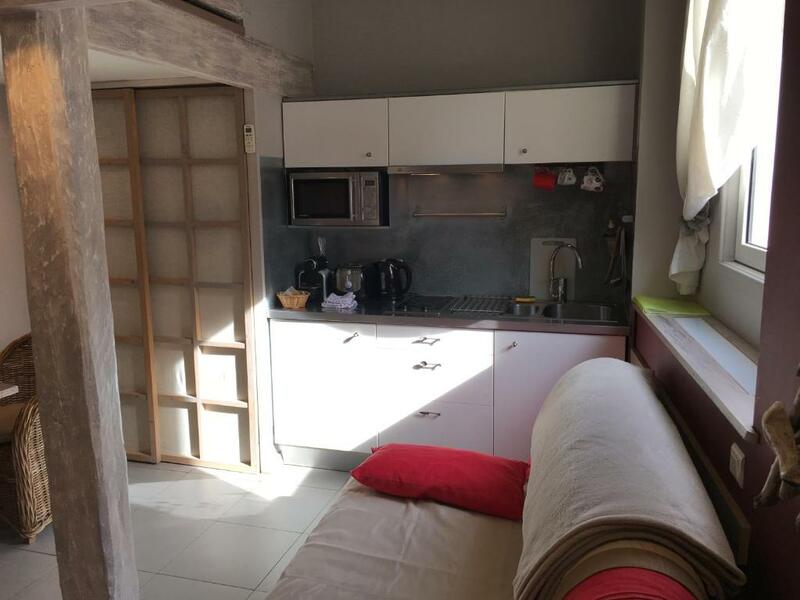 This air conditioned apartment comes with 1 bedroom, a flat-screen TV, a separate toilet and a shower room with a washing machine and a hairdryer. There is a fully equipped kitchen and a furnished terrace. The apartment comes with a queen size bed. The bed can be changed to 2 single beds, upon request. 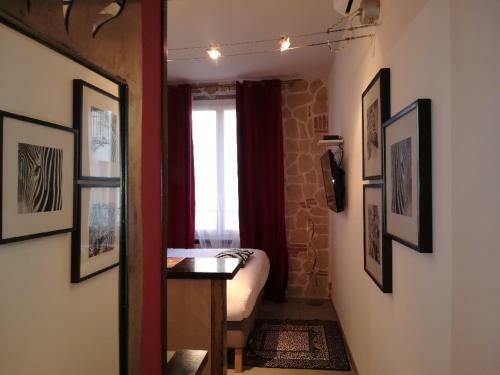 All the apartments are situated in a flowered courtyard in the pedestrian street, where there is a famous restaurant La Maison de Marie. On the 3rd floor all the windows open on the courtyard. All the apartments are different with different themes but with the same comfort. We are a couple who renovated ourselves the apartments for our pleasure and for the guests pleasure. Very central position, inside the pedestrian street. All the shops , the Tram way stop, and bus stops are closed and 5 minuts in walking for the beach and the old historical city. House Rules Intérieurs-Cour takes special requests – add in the next step! Intérieurs-Cour accepts these cards and reserves the right to temporarily hold an amount prior to arrival. The property will contact you after reservation to tell you how to collect the keys for the accommodations. All units are located on the 3rd floor and are only accessed by stairs. I was very disappointed that in a flat with high standards like that you have to pay to get toilet paper! it seems like such a small thing, but I would rather pay 2,3 euros more and not have to worry about the basics! Anyway, don't recommend it to tall people, as the bedroom has really low ceiling. The small alley to reach the building at the night is very dark because (restaurant is close) then no lights at all, so you have to use a torch or your phone light. Hope in the future they will fix this problem. We stayed in the Zebra suite. It wasn't particularly clean when we arrived (not disastrous but certainly not sparkling) and the place definitely needs some renovations--for example, the holder for the shower had been removed and not replaced. This is a mezzanine suite but I hadn't anticipated a climb up a ladder to a small landing up a ladder. At age 60, it still wasn't too bad, but it would difficult for anyone with even minor mobility problems. The free wireless connection was so weak as to be unusable unless one stood near the door. Really comfortable bed, fully equipped kitchen, super location, but peaceful at night. Only criticism was that bath shower was awkward to use, no where to place shower head. Excellent location and very helpful staff. We had a great time ! Not a true shower in the clawfooted tub...would have been nice to have a way to hang the sprayer. Bed needs a new mattress pad that will stay on the mattress better. The towels could be renewed (they were clean, but they were obviously used and rewashed a lot since they got a moist smell after just one shower). The location was amazing, only a 10/15 walk from the beach and old town, 5 from the shops and less than that to the restaurants. It was also 15 from the train station and 5 from our bus stop from the airport. The host gave us excellently specific instructions on how to find it which made it so easy! She also quickly resolved a problem I stupidly created with the safe within a couple of hours. 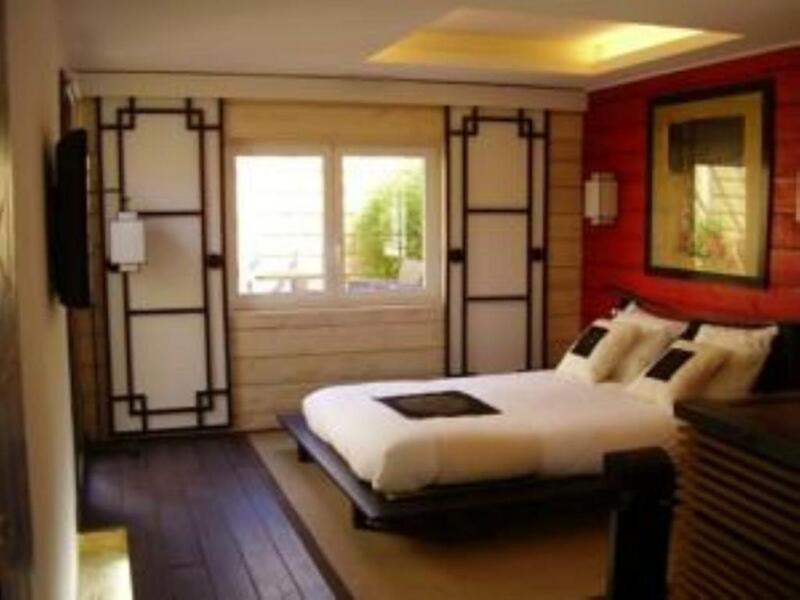 The room was big and spacious (Kyoto), the bed was so comfortable, the air conditioning was fab and the terrace stunning! We flew out in the evening on our check out date and were able to leave our luggage there safely and the host gave us the code so we were able to pop back for things whenever. Would definitely stay there again! I don’t want to be knit picky but I should say that the floor was a bit grubby and you had to hold the shower rose when showering as the little stork it attaches to was broken. But my sister and I washed our clothes in the washing machine ( which is also a dryer) and we cooked a few times there. I had internet trouble and unfortunately missed Jocelyn’s message on how to get the keys and had to ring her -so don’t forget to check your emails for instructions. Oh yes - this funky little place is on the third floor and there is no lift - so make sure your able to carry your own luggage up! But for the money and especially the area it was fabulous and would stay there again! The area! It was fantastic! We were only steps from Massena square and the tram stop that travelled the long length of the main shopping area, which had many shops and department stores - everything a girl needs when on holiday! This tram also went directly up to the Central train station - only about 5 min ride away. The Rue de Massena has no cars and if filled with a plethora of restaurants all offering different menu selections. It took about 4-5 min to walk down this street the the massive expanse of the beautiful beaches of Nice! Yeah loved this place! Wifi was terrible. Could not use it at all. Was frustrating as needed to contact family, book flights etc and couldn’t. Beautiful tucked away and clean apartment. Fantastic location and gorgeous outside terrace. Really well equipped. Comfortable bed and great shower. Ideal location - close to beach & plenty of bars & restaurants. Clean & tidy. Easy to collect keys & check out. It was on the third floor with no lift and no help and as we are in our 60s it was hard to get the cases up. Noisy we were woken up every morning at 8am by noisy workmen at the restaurant below.